Q: I often find that after a swim, I am dizzy. It seems to be even worse after an open water swim. Is this because of the waves or the up-and-down motion? Is there anything I can do to prevent it? A: Thanks for the question, John. Dizziness after a swim is something that many swimmers experience. We will share with you some of the reasons for this, as well as what you can do about it. First, the reason why it happens. You get dizzy after a swim for a couple reasons. First, the combination of cold water and being in a horizontal position can affect blood flow in your body. When you suddenly get up to a vertical position, it can take a while for the blood to return to your head with the right pressure. That is why you may feel dizzy or drunk open exiting the water. It is similar to getting up very quickly and feeling lightheaded, only worse. Second, the up-and-down motion of waves in the water, even if slight, can affect your vestibular system. Your head is moving up and down, side-to-side, and that is enough to mess up your equilibrium. It tends to be worse in open water because the motion of the water is greater, even on a calm day. What can you do about this? There are a few options. First, many swimmers report that wearing earplugs helps reduce dizziness when they get out of the water. 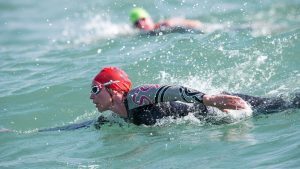 We speculate that this is because the cold water, especially in an open water swim, sneaks into your outer ear canal and slows down your vestibular system even more. Keep in mind that this system is responsible for all of the balance in your body. Second, take a minute to kneel before running out of the water. It can be an abrupt shock to your system to go from horizontal to vertical so quickly, much less running. If you are in T1, you may want to consider kneeling for 5-10 seconds before running to your bike. Sure, you will lose a few seconds, but probably more than make up for them later in T1.